Cassutt racer built in 1978 all red with italian flag in the rudder, tribute tothe italian float plane. An A330 Korean Air Captain, Alpine Guide, aerobatic pilot and world traveller, the Italian native lives and breathes aviation. If you’ve ever marvelled at the classic airplane on static display at Turin Airport, ask Enrico about it – he restored the 1944 DC3 Dakota himself. Now living in Berlin with his wife and two children, the Aviation High School graduate has nearly 20 years of flying and 11,600 hours under his belt. 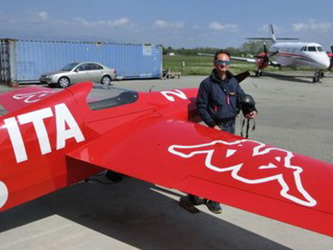 Enrico is no stranger to aerobatics either – the 2014-15 Red Bull Air Race veteran will certainly make his mark in Thailand racing the distinctively painted Spirit of Turin.